Whether an afternoon tailgating before the big game or a fun-filled evening under the dazzling autumn stars, the forecast for this season’s entertaining is trending toward cozy, comfortable and outdoors. Fall is a great season for ditching the paper and plastic and taking your dinnerware outdoors. Tableware industry experts say there are many positives to introducing your “good stuff” to Mother Nature. It won’t blow away like paper plates, and it’s far more environmentally friendly than Styrofoam. While serving finger foods on small plates is extremely popular and encourages your guests to mingle, there’s a definite return toward the comfort and connection of a sit down meal. 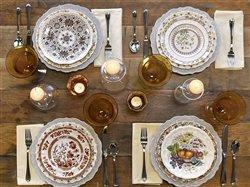 To set the perfect fall table, designers encourage mixing and matching patterns to reflect your distinctive style. Robbins says that may mean pairing a current fall favorite, such as a dinner plate in Woodland by Spode, with vintage American amber glass from the 1940s. She also mixes different pieces. For example, adding a hued glass accent salad plate creates another layer of dimension, while a bright goblet can infuse a much needed pop of seasonal color. There’s really no need to go heavy on the decorations for fall outdoor entertaining. Bright leaves, pumpkins, seasonal berries and other naturals create the perfect autumn décor. Experts say you don’t need a floral centerpiece if you have nature all around you. Instead, use candles to light up your evenings. Looking for more fall inspiration? Robbins and team suggest checking out Replacements’ website at www.replacements.com.